How well do you describe what your company does? There are few sales tools more valuable than a concise, interesting “pitch” that gets listeners as thrilled about your company as you are. It’s something you need to use when you’re making a sales presentation, seeking financing, networking at an event, or even just chatting with a neighbor. 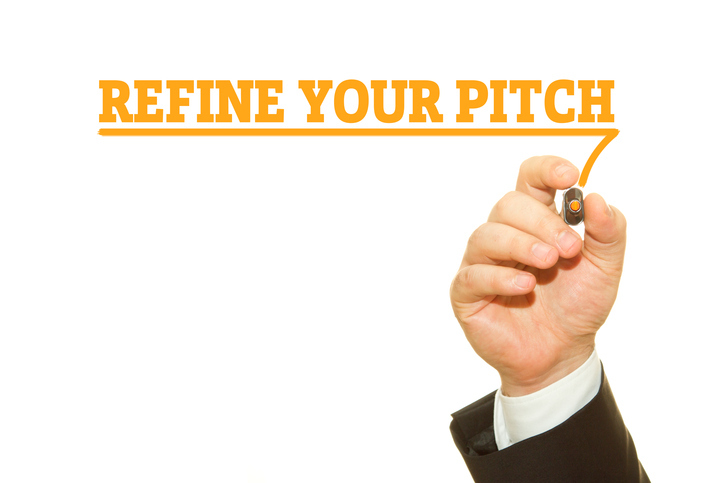 Creating a great pitch is not as easy as it sounds. And even if you have one that you think works, it may be in need of fine-tuning. Often, you’re too close to the details of your company to remember what will interest others. Or you’ve described your company so many times that you start to sound robotic. Successful pitching often comes down to a matter of content and style. First, you need to pare down what you do to a few succinct sentences that someone unfamiliar with your business or even your industry can quickly grasp. Those words then need to be delivered with passion and verve that convey your excitement. Every successful product or service solves some kind of problem. Consider the market need that your company fills. A successful pitch conveys this as a story with a happy ending – the problem your target market faces, and how your company’s approach alleviates that pain. Clearly lay out the benefits you provide – remember, it’s not how a product or service works, but what it does for the person who will buy it. Convey the ways you help customers save time, save money, be more productive or lead easier lives. Interweave relevant facts into your pitch to support your claims, prove your benefits and show your success. Tell your prospect how much repeat business you generate or how much you save a customer who signs up for your service. When appropriate, cite sales numbers, distribution and customer relationships or statistics that demonstrate market potential. If you’ve been recognized with awards or other honors, mention them to back up your claims. Different Pitches for Different Audiences There are number of situations where you’ll need to describe your company. Here’s how to tailor your pitch to each audience. The perfect pitch appeals to the emotions, not the intellect. You need to connect on a very real level with your audience. Use emotion-laden terms to describe why your business makes a difference. Think back, as well, to what got you excited about starting your business in the first place – that story can often communicate the passion and delight you feel about your company. Spend enough time practicing your pitch so it sounds unrehearsed. That way, when you use it, your delivery will seem effortless and natural. Go through your pitch with someone who doesn’t know much about your business – a friend or a colleague in another industry, for instance – to get some unbiased input. You’ll find that pitching gets easier with time. And, if you think of yourself as a storyteller – who just happens to be telling a business story – you can relax and enjoy yourself. When describing your business to someone new, you want to be more like a proud parent showing off new baby pictures than a pitchman pushing product. It’s your passion, enthusiasm and connection that make a pitch memorable. How do you keep the energy after the 200th repetition? • Make it personal. Explain what motivated you to start your business or describe what you love about what you do. Discuss how your customers or clients have benefitted. • Show feeling. When relating your message, use emotion-packed words to generate excitement and passion. My customers help build our business by referring new business to us. I’m so grateful for their faith in us. • Tell a story. Everyone loves a tale, and it makes it easier to remember you and your key points. Relate an anecdote about a company with a similar problem to theirs and how your solution helped them. • Keep it current. Try weaving in a newsworthy item or an emerging business trend appropriate to your audience. • Provide backup. Cite meaningful statistics to reinforce your message. We sold three times as many widgets last quarter as we did a year ago. Whatever you do, let your personality shine through. And remember, no one knows your business the way you do. So go out and tell your story. Use this worksheet to develop a concise, winning pitch for your business. The information contained in this document is meant for advisory purposes only. American Express accepts no liability for any outcome of its use. Do you have a question about business pitches? Connect with a mentor online or in your community today! What Makes a PR Pitch Work?